John Brogan was born in Castletowngeoghegan, Co. Westmeath in 1878. He was a travelling mason. While working on the Orange Hall in Hollywood, Co Down, he met and married Margaret Hickey in 1900. In 1903 they came to Dublin, in those days, by coastal steamer. They moved into a new cottage at 17 Emmet Street, Harold's Cross and this soon became the local music house. They had eight children -Tom, Jack, Harry, Annie, Molly, Lizzie, Meg and Chrissie. 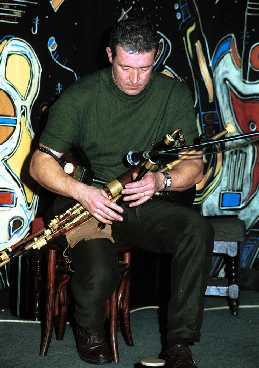 Tom was a piper like his father and won a first prize at a Feis Ceoil. Sadly he was in his twenties when he died. Annie, Lizzie, Molly and Jack all died in their teens and Chrissie still (1999) lives in Emmet Street and Meg, a great fiddle player, just around the corner. Harry was an actor with the Abbey Theatre until his death in 1978 and the father of Feargus, who plays the pipes and lives in Kinvara, Co Galway. 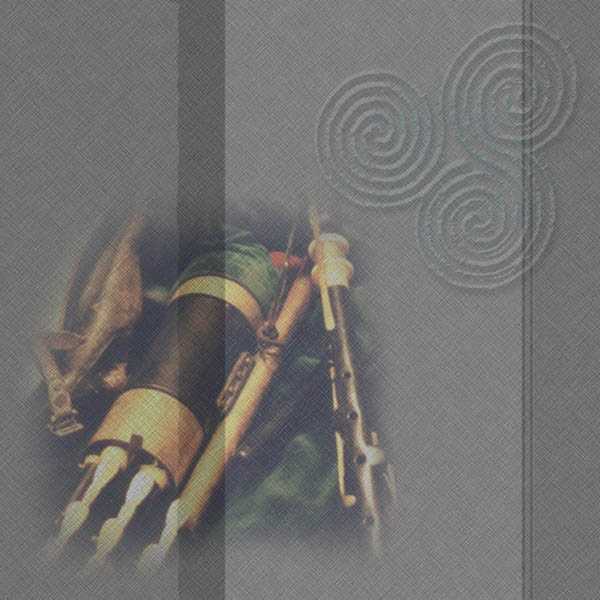 John Brogan was a pipe-maker and, by his surviving children's accounts, a gifted piper. 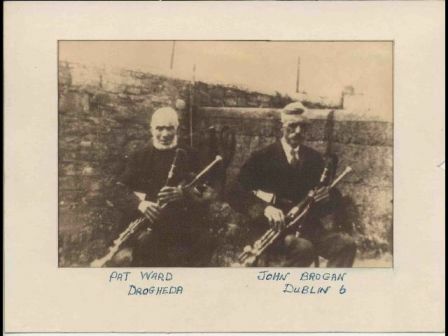 A photograph of John Brogan, alongside the Drogheda piper Pat Ward, exists in Na Píobairí Uilleann and can also be seen at the start of it's Uilleann Pipes Tutor Video, Volume 2. Pat Ward, who was a farmer, was an excellent reed-maker, a noted double-chanter player, and was a regular visitor to Brogan's house until he was killed outside The Black Bull public house in Drogheda in the 1920's by a motor car, allegedly on his way to see a portrait of himself that had just been painted. On his visits to Dublin Pat Ward often brought his niece with him, along with her friend Nell Reilly, who eventually married John's son Harry. It was John who restored James Ennis's Coyne set after he bought them in a pawnbroker's shop in London. Therefore, he must have been very highly respected as a pipe-maker and repairer. When John Brogan died of cancer at the age of 50 in 1928, his widow Muzzie gave his pipes to James Ennis, who in turn passed them on to his son Séamus. An Píobaire - Vol. 3, No. 40. April 1999. The second set my father Tom got from Séamus in 1969. They were minus the tenor drone, chanter and bellows. Matt Kiernan, a pipemaker from Ballivor, Co. Meath, who lived nearby in Offaly Road in Cabra, made a new tenor drone for them. My father Tom, with Matt's help, made a chanter on his lathe for them. "J. Brogan, Dublin" is clearly stamped on the stock and on various other drones and regulators. In more recent years I am playing a Kevin Thompson chanter made from a length of lignum vitae which I gave him. An unusual feature was that the bass regulator could be removed completely from the stock, which I believe was for the convenience of packing them into their pipes case. As it would never quite stay in the exact spot where the two holes should have met to allow airflow from the stock to the regulator, I asked Alain Froment to attach the regulator permanently to the stock in 1986. Kevin Thompson subsequently lengthened the top of the bass regulator as the existing one was far too short and uncomfortable when playing. In doing this I asked Kevin to place a seal at the top of the old tubing so that the reed would be encased there and I would not have to be removing the reed each time that I played the pipes. The old ivory top was then placed on the new extension. This was an idea that I got from Rowsome's Felix Doran set and I find it very convenient. Also the wood in the base drone had to be replaced as it was porous and Andreas Rogge made a replacement one for me when I was over teaching in Tubingen, Germany about 9 years ago, while retaining the original brass fittings and tubing. I hope to add some further information to this article in the near future and also relate one or two interesting stories about the Brogan set! Stay tuned! !